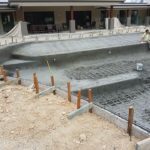 Building a concrete pool is a complex process; however, the end results are always worth the extra effort taken in the beginning. To give you a brief outline of what occurs during a pool build, read on. Where do you want to locate the pool, and can it be built there? What size pool are you looking for? Or, more importantly, how much pool can you afford? This includes the depth, width, shape, etc. What style of pool are your looking for? Plunge pool, lap pool, infinity pool? 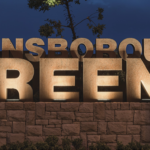 Are there zoning restrictions in your locale? Due to the extra space needed for the concrete structure of your pool excavation, the dig line is always larger than the final outline of the pool upon completion. This includes extra width and depth. 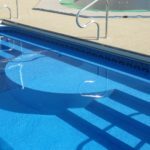 At this point, your professional concrete pool builders will take these factors into consideration to ensure that your pool is perfect. Once the excavation has been completed to specifications, the formwork and reinforcing steelwork is inserted. 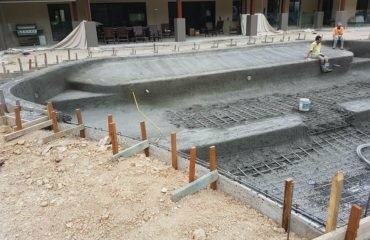 The formwork holds the shape of the pool and the steelwork provides extra reinforcement for the concrete, stopping it from cracking and enabling the concrete to withstand the pressures when full. All the pool’s plumbing is installed and completed before concreting. Much like the plumbing, all essential electricals which are going to be encased within the structure of the swimming pool are installed prior to concreting. This includes wiring for underwater lighting, etc. Concrete is applied to the steelwork using a concrete pump with a nozzle attached. As the concrete is pumped through the hose, it shoots out of the nozzle with enough force to stick to the steel and formwork surface. Pool builders use a type of concrete blended specifically for the construction of pools. This enables the concrete to be sprayed vertically. Once the concrete has been allowed to dry, it is finished off and polished to take away all roughness. Your chosen pool surfacing is then added. This can comprise of tiling, exposed aggregate, or plaster. The coping is then laid to form an attractive barrier to your pool line. With the final touches, including a myriad of elements from paving, decking and landscaping, your pool is transformed into a dream oasis. 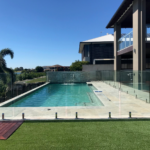 For all the answers and the best advice, contact Cozy Pools, Gold Coast’s leading concrete pool builders.